Beautifully Crafted Oak Garages Built Across Berkshire. We build Classic oak garages locally around Berkshire and the surrounding counties. Our oak frames have a reputation locally for their attention to detail and the generously sized timber that we utilise throughout our range of designs. We have an entirely flexible approach to the services that we offer, supporting you from planning through to completion. 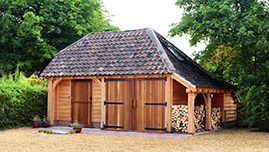 Our garages are built from quality oak timber, historically used due to its quality and durability. This beautiful timber creates a strong, traditional building which will stand the test of time. Whether you require a new garage for your classic car or an extra room for guests, we have a large range of designs for you to choose from, which can be customised to create your own bespoke oak building. We utilise traditional mortice-and-tenon joints in our builds rather than modern quick-fit methods. Our braces our hand-crafted, meaning no two garages are exactly the same. 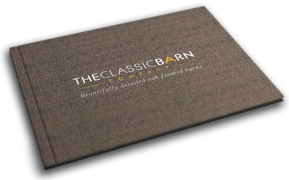 These are just two of the carefully considered details that you will find in a Classic Barn, adding to the timeless style of our designs, which suit rural surroundings perfectly. By understanding the importance of not just selecting the best design but also in choosing a reputable company for your oak framing project, we maintain our accreditation to the Guild of Master Craftsmen so you can be assured of the standards that uphold the integrity of The Classic Barn Company. We can project manage the full build for you including ground works and roofing so you can be assured of our standards throughout the entire process. Take a tour of our gallery to see examples of our work and the details that you will find in a Classic Barn. Please feel free to contact us to discuss your personal project or request a brochure to guide you through our classic features and designs. 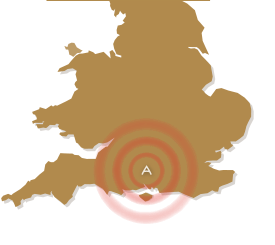 Commissioning projects in Newbury, Thatcham, Wokingham, Bracknell, Reading, Burghfield Common, Crowthorne, Hungerford, Sandhurst, Sunningdale, Thale, Maidenhead and Windsor.